The European Open Science Cloud (EOSC) aims to provide by 2020 a virtual repository to access data from publicly funded research. The EOSCpilot is a two year project to support the first phase of development of EOSC. The EOSCpilot data interoperability task aims to establish principles, propose recommendations and demonstrate how FAIR data hosted by domain specific data repositories can be exposed to EOSC to be used and reused by EOSC services and users. This work relies on EOSCpilot use cases, data resources from domain specific research infrastructures and requirements from e-infrastructures services. In this workshop we will review data models used to describe datasets and data catalogues as well as requirements of infrastructure services dependent on datasets. The workshop will be focus on understanding, testing and evaluating existing technologies to expose and facilitate the integration of dataset metadata. The first day we will have updates and discussion about relevant activities in the context of EOSC. At the end of the first day and in the second day we will have more hands on activities with data providers and technology experts to explore technologies and metadata models to expose data into EOSC. 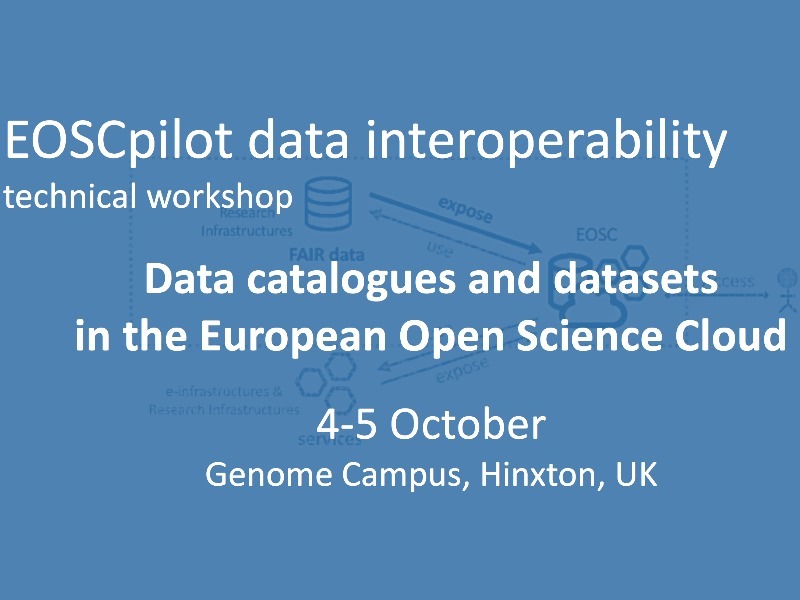 The EOSCpilot data interoperability technical workshop will be collocated with the Bioschemas adoption meeting hosted as well at the Genome Campus in October 2-3.